What is Smiles of Oman? A pioneering campaign to raise the standards of customer care throughout the country, launched by the National Hospitality Institute. Who is it for? ‘Smiles of Oman’ is for those who work in airports, hotels, restaurants, shops, banks, transport, medical centres, or any large and small businesses who deal directly with customers. Why Smiles of Oman? Oman is a fast-developing nation, with an expanding service sector, and increasing numbers visitors. Now is the perfect time to upgrade and develop skills throughout the Sultanate, setting a new benchmark for customer care. Great customer care starts with a smile. How does it work? Organisations that sign up for ‘Smiles of Oman’ training programmes are visited by mystery shoppers, who assess the current skills of staff. Employees are then scheduled for ‘Smiles of Oman’ training, which caters for three levels of customer care staff. Starting with a Smile is a one-day programme for people with limited or occasional customer contact, such as drivers, tea-boys, supermarket ‘baggers’ or doormen. Offering the basics of customer care, the course can be delivered in Arabic and/or English. Serving with a Smile is a one-day programme for front-line customer care staff, such as receptionists, retail assistants, cashiers and waiters. Leading with a Smile is a two-day programme for managers/supervisors who lead customer service teams. The training, delivered at nhi premises, is highly interactive, good fun, and designed for Oman. The content can be adapted and customised to the needs of individual organisations, and delivered in-house. Organisations and companies who sign up for ‘Smiles of Oman’ training programmes are awarded a ‘Smiles of Oman’ plaque, which can be prominently displayed for public view. Trainees receive a certificate and ‘Smiles of Oman’ badge. What are the benefits for customer care staff? Customer Charters - keep your customers informed by developing and displaying a customer charter to tell them exactly what service behaviour to expect from your front-line staff. Mystery Shopping Experiences - let your employees discover firsthand the power of mystery shopping to experience the differing levels of customer care. Smiles Partnership - show your commitment to improving national levels of customer care by becoming a sponsoring partner of the ‘Smiles of Oman’ campaign. 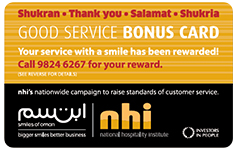 a ‘Smiles of Oman Good Service Card’ to reward them for their excellent service.